The St. Patrick's Day Society started as a group of friends with a simple idea over a decade ago, which has grown into a major event for the City of Wilmington. 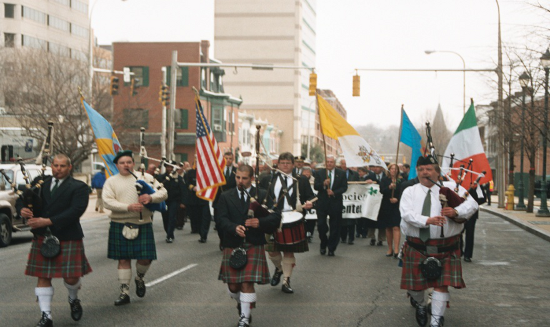 In 1994, a small group of dedicated community leaders including Joe Farley, Sr., Mike Harkins, and the late Mayor Dan Frawley, wanted to improve the annual celebration of Irish heritage on St. Patrick's Day by creating an event to benefit the local Wilmington community. They decided to hold an annual communion breakfast. With a combination of fellowship, Irish culture and fundraising, the breakfast has reaped numerous benefits for local citizens over the years. The St. Patrick's Day Society has marked the most important day on the Irish-American calendar by celebrating its culture and reaching out to the greater community. All of the funds raised for the St. Patrick's Day Communion Breakfast are used to support the Center. Sadly, Mayor Frawley, who was so important in the creation of the event, passed away before the first year. In his honor, the Society established the Daniel Frawley Community Service Award. The honor recognizes individuals or groups whose dedication and service past and present improves the Wilmington community. The success of the Communion Breakfast fundraiser has had a direct impact on the Center's ability to provide more programs and services to more people.